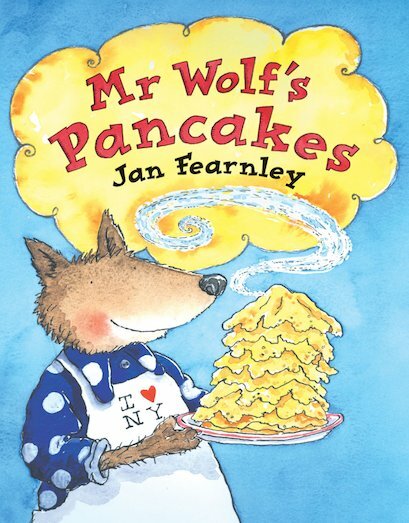 It’s dinner time for Mr Wolf, and today he fancies some tasty pancakes. The trouble is that he doesn’t know how to make them. Asking his nasty neighbours is no use – they’re a mean and horrible lot who refuse to help. Poor Mr Wolf has to do all the work by himself. So what will happen when those nasty neighbours want to help Mr Wolf eat his delicious pancakes? How will this put-upon wolf bite back? A fantastically lively (and wolfy) retelling of a favourite tale, starring rumbustious rascal Mr Wolf! I like this book because it encourages you to help other people. It’s very funny and the pictures are good. I would recommend this book to 4 year olds who don’t want to help there mums.